Order custom printed Neck and Shoulder Beads – these relaxing wonder beads offer soothing pain relief and come with aromatherapy scent. Imprint area on bag, approx. 3inches x 4inches. Safety tested and FDA approved. 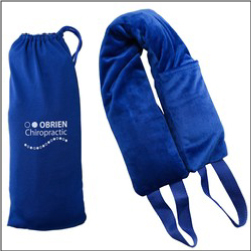 Great for spas, chiropractic, healthcare, salons, massage therapy, corporate breaks, and more. Can be microwaved for soothing warmth. Available in 6 shapes and 4 colors.